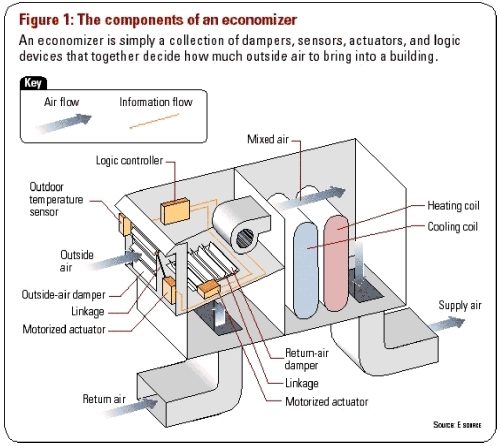 Economizers are used to allow outside air to cool the space in the spring and fall. This saves energy over the conventional mechanical cooling system which also protects the compressor from operating in low ambient conditions that can cause mechanical failure. When free cooling is not available, the compressors will be cycled on by demand. When free cooling is available, the outdoor-air dampers will modulate to supply 55 degree air to the space. Most economizers use an enthalpy / temperature control to limit the amount of humidity allowed before the change to mechanical cooling furthering comfort to the tenants. One of the biggest advantages of an economizer is the ability to cool interior spaces or space with a large heat load when the outdoor ambient temperature is too cold for safe mechanical cooling. Save the compressor and increase comfort! How much energy can you save? As much as 10% a cooling season, as well as less wear on your mechanical cooling system. Economizers require minor maintenance to continue to operate at an efficient level. The mesh filters need to be cleaned or throw away filters should be changed on a regular basis. The control motor and linkage should be checked periodically. Economizers are used to allow outside air to cool the space in the spring and fall. This saves energy over the conventional mechanical cooling system which also protects the compressor from operating in low ambient conditions that can cause mechanical failure. When free cooling is not available, the compressors will be cycled on by demand. When free cooling is available, the outdoor-air dampers will modulate to supply 55 degree air to the space. Most economizers use an enthalpy / temperature control to limit the amount of humidity allowed before the change to mechanical cooling furthering comfort to the tenants. One of the biggest advantages of an economizer is the ability to cool interior spaces or space with a large heat load when the outdoor ambient temperature is too cold for safe mechanical cooling. Save the compressor and increase comfort! As much as 10% a cooling season, as well as less wear on your mechanical cooling system. Economizers require minor maintenance to continue to operate at an efficient level. The mesh filters need to be cleaned or throw away filters should be changed on a regular basis. The control motor and linkage should be checked periodically.